During 2011 and 2012 we saw the global consumption of cement rise to new levels of 3585Mt in 2011 and 3736Mt in 2012*. With production rising, the cement industry faces a number of challenges including the scarcity of raw materials, depletion of fossil fuel assets, and the ongoing increase for demand forcing rising global environmental concerns. Each tonne of Ordinary Portland Cement (OPC) produced releases on average 0.5 ton to a similar amount of CO2 into the atmosphere. In perspective of man-made carbon emissions, that makes for approximately 5 – 6%. To meet these challenges, cement manufacturers are turning to technology and new production methods to reduce or eliminate CO2 emissions. Emission reduction is also being driven by governments and regulators, with the introduction of new regulations, environmental taxes and rising fuel prices. To support these impacts, locally available minerals, recycled materials and (industry, agriculture and domestic) waste may be suitable for blending with OPC as substitute, or in some cases replacement, binders. Consumes 2% total global energy consumption. To counter this there are environmentally alternative concrete products being offered. These alternatives rely on technological advances that include energy-efficient, low carbon production methods, novel cement formulations, geo-polymers, carbon negative cements and novel concrete products. Chinese foreign expansion, it has locally reach capacity saturation. 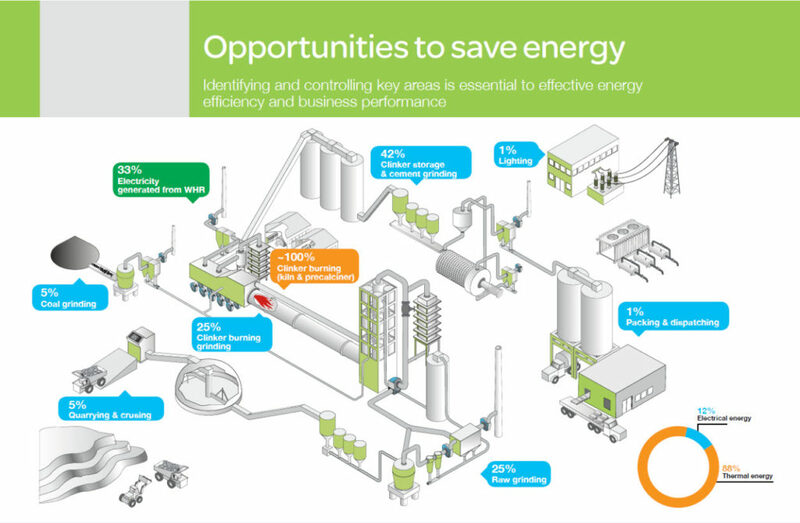 There is a clear need to increase the overall Energy Optimization in cement, with technology playing a key role. Leading the change are new solutions around energy monitoring and optimization software, waste heat recovery systems and advanced process control, which we will look at in future blogs. Changes are abound for cement producers – how are you approaching these changing times? Doing more (better concrete) with less binders (OPC and SCM), going from volume to quality, has proven to be a win-win situation for those who are capable to change. It will fully respond to the People (poverty eradication and capacity building) Planet (CO2 and raw materials) and Profit (for concrete AND cement producers). Yes Agree, any efficient utilization leads to better performance. Thank you for posting this blog and sharing this information and doing more with less binders (OPC and SCM), going from volume to quality, has proven to be a win-win situation for those who are capable to change. It will fully respond to the People (poverty eradication and capacity building) Planet (CO2 and raw materials) and Profit (for concrete AND cement producers).. Thanks for write such informative blog Ashutosh. Cement manufacturing produces CO2 as it requires very high temperatures to burn raw materials and give the clinker its unique properties. Thank you Rajesh for taking the time to comment, I am happy you enjoyed my blog.